Ian Hodges, Managing Director of Horncastle Group, said: ‘The Beacon is a £10 million project and because it was supported by the ERDF we were able to deliver the quality which you would not otherwise achieve in this market. David Garness, Managing Director of Garness Jones, said CHCP and InterBulk were attracted by accessibility and affordability at The Beacon. He said: ‘The CHCP found that it was more cost-effective to buy their own headquarters at The Beacon than to continue renting and InterBulk saw their move as an affordable means of relocating into modern premises and staying in Hull. ‘Between them CHCP and InterBulk have brought about 200 people onto the site and the new offices are capable of adding between and 200 and 300 more people to the campus. Amenities which have been added to the site include a Marston’s pub and restaurant and outlets for KFC, Costa and Burger King. Mr Hodges said another operator will open later this year. Paul Dransfield, Managing Director of PDR Construction, said: ‘We have been involved with The Beacon for three years and it stands out as excellent example of developer, funder and contractor working together and delivering a quality office destination on this gateway site into Hull’. ‘When Horncastle, working with ERDF, pushed the button in early 2013 it was the first speculative office development in the area for more than five years and now, three years on, the team have delivered 70,000 square feet of Grade A office space which has attracted some prestigious tenants and attracted award nominations for outstanding design’. Horncastle Group are well underway with the final office building at The Beacon, Hull and the steel frame is now complete. With completion set for November 2015, more Grade A office space will soon be available with options from 3,300sqft to 10,463sqft over three floors. To enquire about space available at The Beacon, please call us on 01482 631295 or for more information visit www.thebeaconhull.co.uk or follow us @TheBeaconHull on Twitter. Works have commenced on the final one of four grade A office buildings that have been in development since 2013 at The Beacon in Hull. Office Four will offer high quality office space of 3,300 to 10,463 sq.ft, with the building available to occupy as a whole or in suites of 3,300 sq.ft. PDR Construction, from Hull, who have developed the previous three office buildings, won the tender for Office Four which is due to be practically complete by the end of September 2015. Office occupiers at The Beacon include City Health Care Partnership in Office One and Interbulk Group in Office Two. Office Three is currently available and on the market offering 5,000 – 15,779 sq.ft of grade A office space, which is of limited supply in the East Yorkshire region. The headquarter office development is located on Brighton Street in Hull, in the heart of a vibrant business area. The Beacon is situated opposite St. Andrews Quay, which is home to the likes of Currys, B&Q and Laura Ashley, with an ASDA superstore is also located near-by. Leisure amenities within The Beacon itself include a KFC, Costa Coffee and a Marstons Pub & Restaurant, with Plot 2 sold for a further drive-thru restaurant to be developed. The Beacon has a great profile to the Clive Sullivan Way A63, and this provides a business with great access and high visibility. To enquire about office space available at The Beacon, please call 01482 631295. For more information, visit www.thebeaconhull.co.uk or follow The Beacon on Twitter @TheBeaconHull. Office Three at The Beacon in Hull is now available for sale or to let. The building offers 15,000 sq.ft of high quality, grade a office space, able to split into suites from 5,000 sq.ft. Join City Health Care Partnership and Interbulk Group at this head-quarter office development. To enquire, please call 01482 631295. A report published earlier in the year by CBRE, based on its latest annual European Occupier Survey, shows employee well-being has risen up the agenda for company strategies with workplace strategies becoming increasingly more important in the retention & attraction of staff and when making real estate decisions. Respondents for the CBRE research were mainly Western Europe and North American companies within multiple sectors, the largest of these being professional services, banking and finance, technology and telecommunications. There has been a shift from previous times where cost was the main driver for core business strategy, potentially affecting the relationship between a business and its staff negatively. The workforce now plays a large role in location, with 33% of respondents stating cost of labour or labour shortage had an effect on location of a business. 65% of company’s researched also stated factors such as: amenity rich locations, quality work space and transport accessibility are increasingly sought by companies for building selection and to attract the younger generation. We believe workspace and location should both be high on the agenda for any business looking to improve staff productivity and retention, or attract the younger generation. Staff wellbeing is key for maximum performance, and having a workplace that provides high quality space can be essential for business growth. Relating to challenges with workforce and quality work space, an issue City Health Care Partnership (CHCP) had before re-locating to The Beacon offices was a lack of space at its previous office building. An environment where it’s 100+ business centre staff could communicate efficiently was lacking, therefore Horncastle provided open plan office space with quirky and modern interior features to improve performance, functionality and boost staff morale. Check out CHCP’s workspace here. Location, environment, amenities, transport links and quality space are all intricate spokes of a wheel; equally important for a workplace strategy and vital to retain existing & attract new staff to improve business performance. To read the full article on staff well-being by CBRE, please click here. Follow us on Twitter @TheBeaconHull & @HorncastleGroup. Horncastle Group plc have developed the third of four grade A office buildings at The Beacon in Hull. Contractors PDR finished the high specification building on time and budget in March 2015. Office Three is 15,779 sq.ft (net) and is currently the only grade A speculative building in East Yorkshire available for immediate occupation. Office suites of 5,000 sq.ft are available to occupy on a floor-by-floor split basis and an occupier has the option to take the ground floor suite with a separate entrance to the side of the main entrance, providing exclusive access and a reception area. 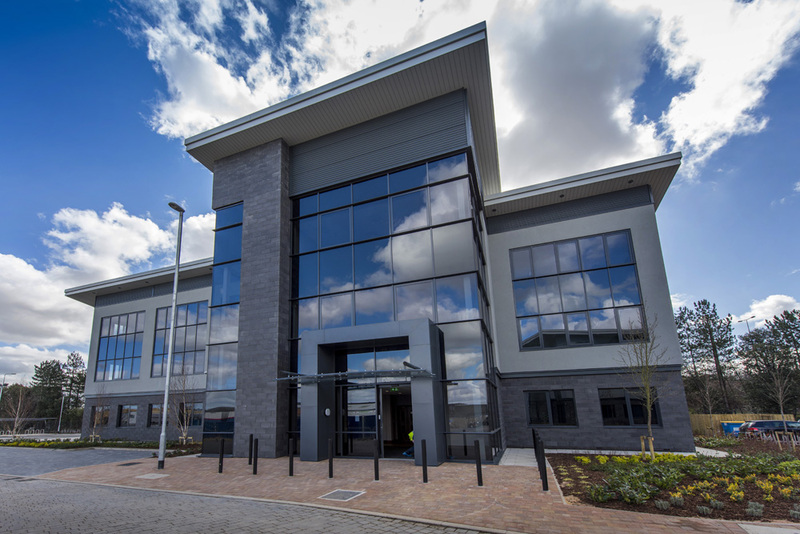 At Horncastle we are extremely proud to be able to deliver high quality offices for businesses in the region such as Interbulk and City Health Care Partnership, who occupy Offices One and Two. The Beacon has been developed with part funding from the European Regional Development Fund 2007-2013. If you would like more information, please visit www.thebeaconhull.co.uk or call 01482 631295. 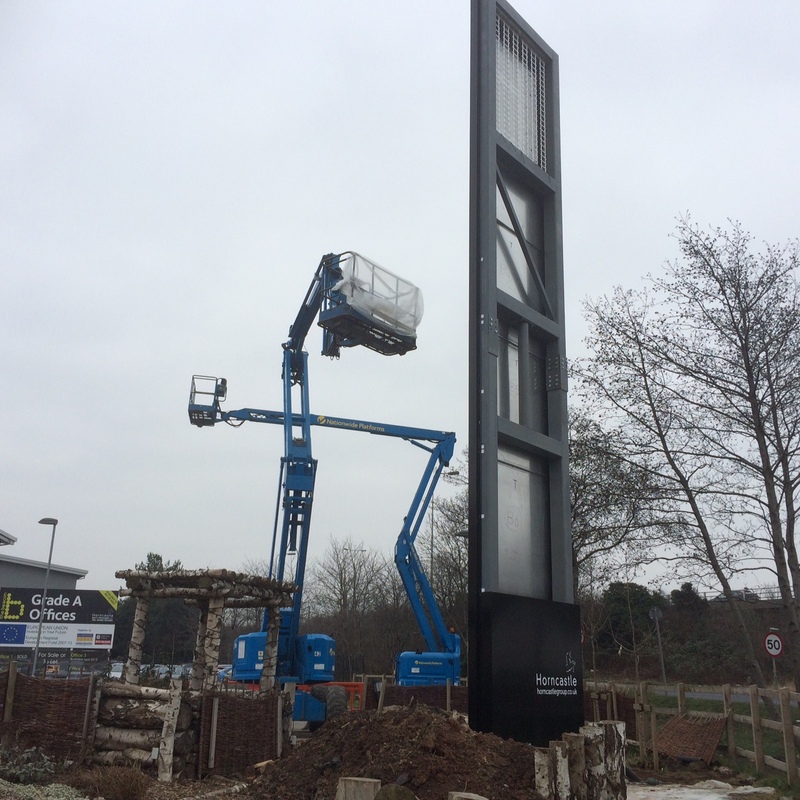 It has been an exciting couple of weeks at The Beacon as a large new totem sign has been erected at this modern business park & office development in Hull. 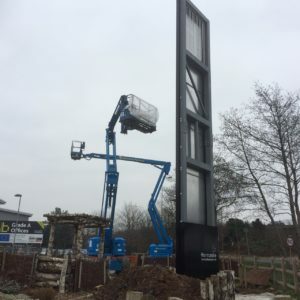 The totem sign stands at a staggering 12 ½ meters tall and illuminates when the night rolls in, meaning high visibility from the surrounding area. The new totem can be seen from the main dual carriage way heading in and out of Hull City Centre (take a look next time you’re passing! ), and heralds the start of the finish at this modern office development. With Office Three completing in April and Office Four set to complete by September, along with a second drive-thru restaurant and a hybrid office/industrial building, The Beacon office and leisure park is due to be fully developed by the end of this year. The totem sign introduces The Beacon and welcomes visitors driving into Hull to one of the most prime business parks in East Yorkshire. With a shortage of Grade A office space in East Yorkshire, The Beacon offers the perfect headquarter environment in an excellent location with fast access to the A63 and M62. Take a look at pictures below of the totem sign during the construction process. If you are interested in learning more about how The Beacon can help your business grow, please call 01482 631295. Like our news updates? Follow us on Twitter @TheBeaconHull. Progress of the brand new Grade A office building at The Beacon in Hull. The building has a total net area of 15,700 sq.ft, able to split into small suites of 5,000 sq.ft. The building has also been designed with the capability of two separate entrances, meaning one exclusive entrance/reception area and an option for another shared entrance/reception area depending on requirements. Office Three will be ready for occupation in April 2015. The third of four brand new grade A office buildings at The Beacon in Hull, is over half way to completion now and will be ready for occupation at the end of March 2015. Office 3 offers 5,000 – 15,779 sq.ft of high quality, grade A premium office space. The building is available for sale or to let and is able to be split into three separate floors depending on your requirements. Take a look at our Gallery section for more pictures of Office 1 and Office 2 exterior and interior. Like our news updates? Follow us on Twitter @TheBeaconHull and @HorncastleGroup.